SKA Films, Polygram Filmed Entertainment, Handmade Films Ltd. 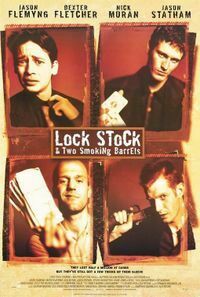 Lock, Sotck & Two Smoking Barrels is a fast paced British comedy about four friends who need to make a lot of cash quick after loosing a sketchy poker match. Lots of British humor, off the wall characters, and a line up of unbelievable scenes put director Guy Ritchie on the map.